If you are looking for homes for sale in Sun Lakes Cottonwood, you’ve come to the right place. Cottonwood Country Club is the second of the five Sun Lakes communities with just over 2,700 homes consisting of both single family and villa styles with one shared common wall. Located in the southeast valley bordering Chandler, the location is ideal and only 30 minutes from Sky Harbor International and Mesa Gateway Regional Airports. 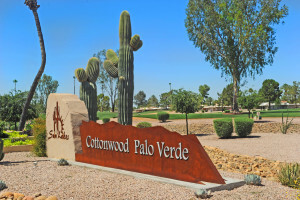 Cottonwood is convenient to all major freeways including the I-10, the 101, the 202 and the Price Road Corridor that is home to hundreds of high tech clean industries. With 2,726 homes ranging in size from 1,000 to over 3,000 square feet there are plenty of options for consideration. These homes are situated on golf course lots, waterfront lots and private lots with a block fence. Prices range from the $100,000’s to the mid to upper $300’s. Cottonwood and the first of the gated communities, Palo Verde, share the same homeowner association known as Cottonwood Palo Verde HOA. When you buy a home in Sun Lakes Cottonwood you are buying a lifestyle with resort amenities. It’s like being on vacation every day. An 18 hole championship golf course, tennis and pickle ball courts, heated swimming pool, lap pool, fitness center and restaurants are just a few of those amenities to enjoy. Cottonwood also has plenty of lakes and walking trails for outdoor enjoyment. The ballroom is home to many dances and theatrical productions. Or join in a card club or a hiking or biking club. Sun Lakes began in the 1970’s with Sun Lakes Country Club and was followed by Cottonwood and then the three gated communities of Palo Verde, Ironwood and Oakwood. Each has its own unique feel and personality and all have their own amenities. See homes for sale in Sun Lakes Cottonwood below and call us at 480-440-0849 for more information. The Kolb Team is a Sun Lakes top producing real estate team. We would love to tell you why we love living here and answer any of your real estate questions.